Oily hair is like oily skin which can sometimes be as a result of the habits you keep. Of course, hair-type also plays a role in how oily strands will appear. As such, many ladies are constantly trying to find ways to make their hair look less oily. Here are some of the ways you can pull this off. Dry shampoo will not only get rid of oil from your roots making your hair appear less oily, it will also allow you to spend more time between washes which will make your hair less oily in the long run too. If you prefer to go the old-fashioned route, use baby powder instead of dry shampoo. It will work the same way if you sprinkle some on your roots and rub it in. If you have dark hair and the baby powder causes too much of a white cast, just brush some bronzer onto your roots instead or mix the baby powder with cocoa. 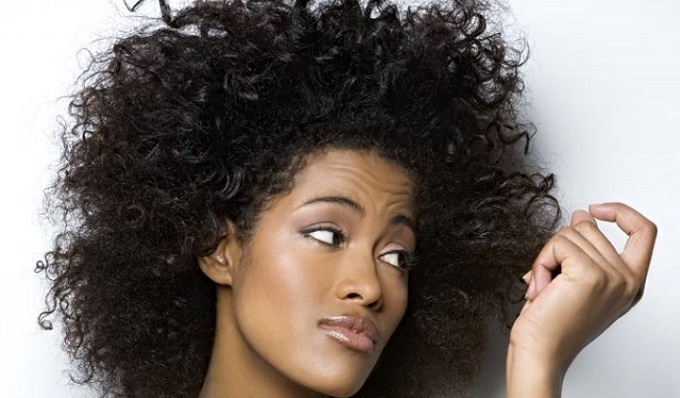 The more closely your hair lies on your head, the more oil it comes in contact with. Curled hair (whether natural or not) gives a little more volume at the roots which keeps hair from becoming too oily too quickly. This sounds totally counterintuitive. But if the scalp is constantly being stripped of oils, the more forcefully it tries to replace those oils. This makes hair oily. Try washing every three-four days. Your fingertips and face both produce oil that can easily be transferred to your hair, avoid playing with it or using styles that allow too much hair to touch your face.